Below are a few brief things about Surviving Bear Island. A little history and a look toward the future. 1. Surviving Bear Island, my debut novel, a survival story set in the wilds of Prince William Sound, Alaska comes out March 25th (Move Books). Having completed the first draft of this novel 10 years ago, and then countless drafts since then, I feel incredibly fortunate to have found a home for this book. As my agent was trying to sell a different manuscript we started working on getting Surviving Bear Island ready for submission. 2. When I wrote Surviving Bear Island I didn’t envision it being illustrated. In fact, I first wrote it as a young adult novel and then six years into the revision process, it morphed into both first person and middle grade. One thing the illustrator James Madsen said about Surviving Bear Island is: "This book in particular has been one of my favorites because I grew up an avid outdoorsman and there’s no where I’d rather be than in the mountains or around wildlife." I feel fortunate to have my book matched with an artist who has spent a lot of time in the outdoors. In the past fifteen years James has illustrated more than 75 books. Below is one illustration from the book. James also did the cover. 3. 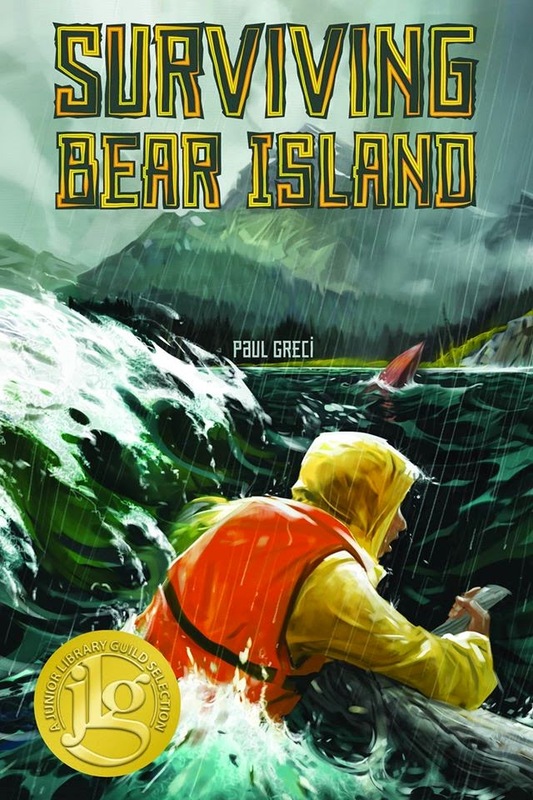 Surviving Bear Island is a 2015 Junior Library Guild selection. Again, I feel incredibly fortunate that the Junior Library Guild is putting their energy into getting my book into school and public libraries. 4. As of a couple days ago you can now pre-order Surviving Bear Island on Amazon. As Surviving Bear Island nears publication I'm working on two books. One is an MG adventure set in Interior Alaska. The other is a contemporary YA novel. Can't wait to read it, Paul! Love that illustration - it caught just the right moment, and carries movement as well. Looking forward to this book! Thanks, Steve! 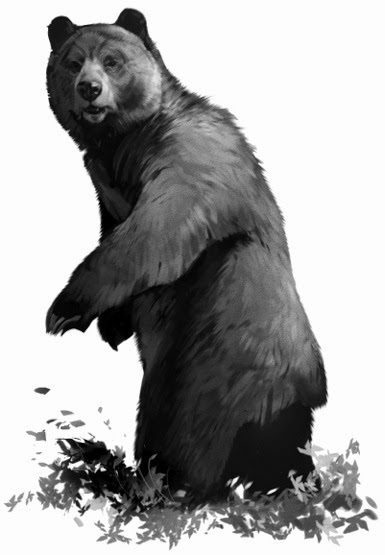 Yes, the bear really does come alive in that illustration! Thanks, Hilary!! Working on those plane reservations right now. So excited to read it, Paul! I'm currently working on revising a manuscript I started in 2009. It hasn't been 10 years yet, but it has undergone so many drafts I have long since lost track and sometimes wonder why I keep trying. Hearing this story of how Surviving Bear Island came to be published is a great reminder to never give up on the stories that are worth telling! Thanks, Diane! And, good luck with your story!!!! Paul, this book looks so exciting and I just pre-ordered it on Amazon - although I may have to hide it away to read it before my son does. And I think it's so fascinating to hear the behind the scenes stories about how a book comes to life and gets published - and how much a story can change before it finds its place. A writer must have a certain amount of grit and love for his or her story to stick with it and change it from YA to MG and 3rd person to 1st person POV as you have done. And in doing these changes I think, as writers, we seek the truth - which is to discover the most compelling path to tell our story. This may also include eliminating characters and even combining characters, as I've done in my recent book handed in to my publisher. Now I have to wait and see if it worked (but there are sure to be more changes!). Congratulations on this coming out, Paul! Thanks, Donna! Good luck with your recent book! One of my simple writing mantras during the revision process is "you have to mess up your story in order to make it better..."
Indeed, Paul! I love the revision process as much or more so than first- drafting. It's where you find the layers to peel back and uncover the power in your story - and where you find the golden nuggets to polish and make your story shine! I admire your persistence, Paul--and I look forward to supporting SURVIVING BEAR ISLAND on its release! Excited for your debut novel to release, Paul! LinkedIn is for Writers Too! Middle Grade, Young Adult, or Both?